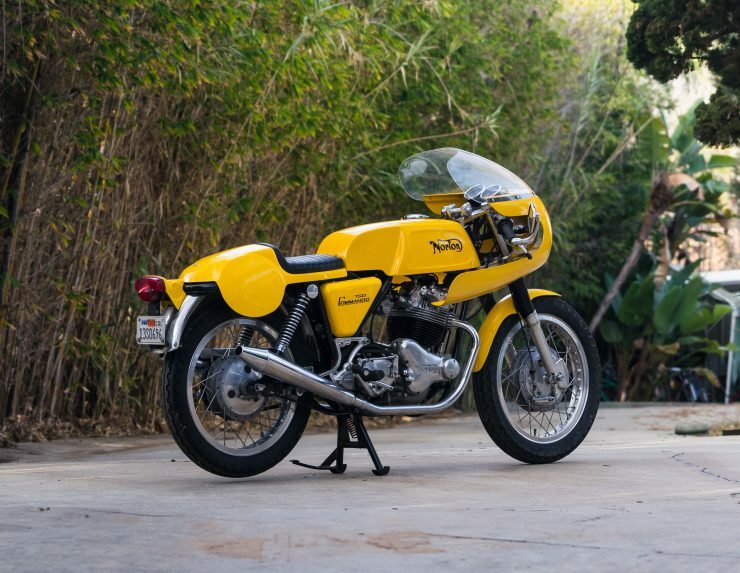 The Norton Commando Production Racer was often colloquially referred to as the “Yellow Peril”. 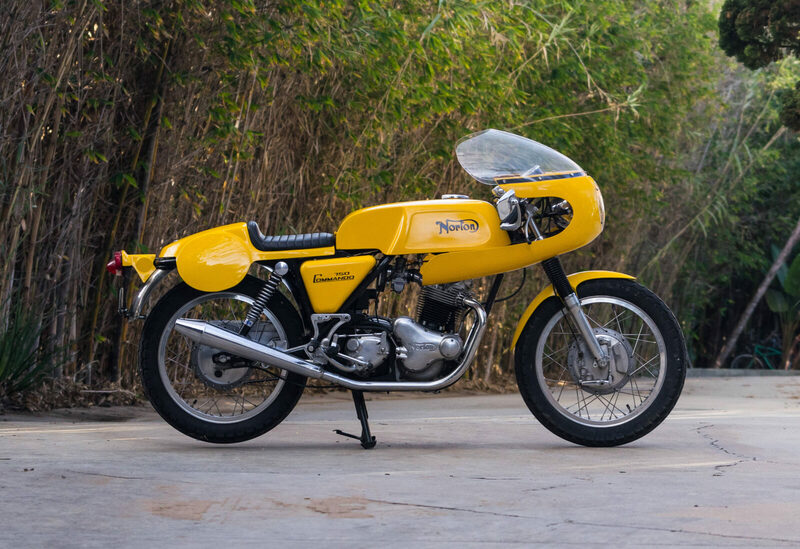 The bike would be offered as a road-legal factory racer to privateers and to well-heeled boy racers, so that the Norton factory could homologate the model for its own racing efforts. 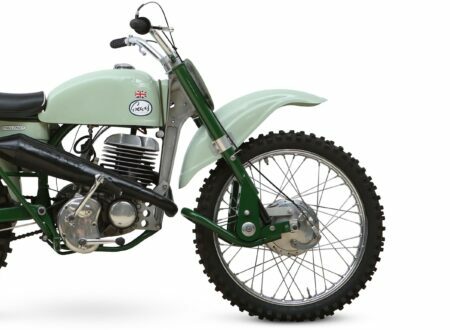 The first major victory for the Production Racer was a win at the 1970 Thruxton 500 with Peter Williams and Charlie Sanby taking turns in the saddle, later the same year Williams would come within 1.6 seconds of winning the Isle of Man Production TT but he ran out of petrol on the last lap within sight of the checkered flag. 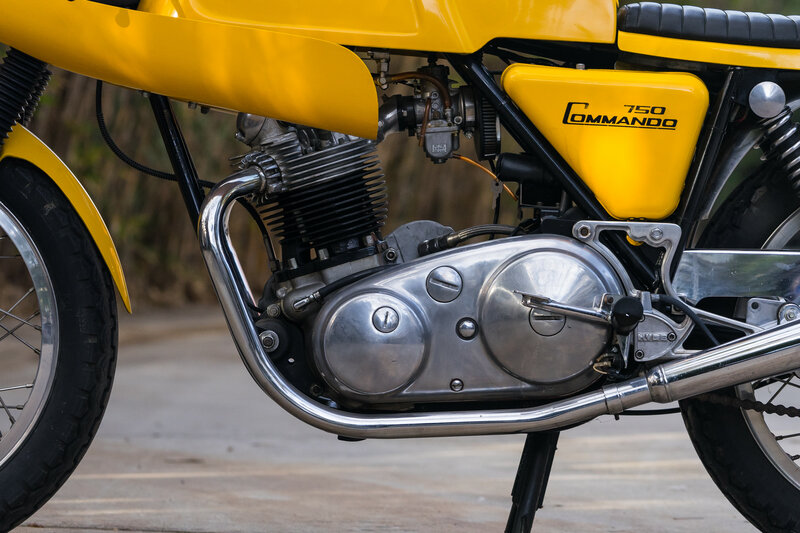 Cost-control was king at Norton in the late 60s and early 70s, so the Yellow Peril could never have been a bespoke design, it was very closely based on the production Norton Commando, but it each was built with the best performance parts of the day – giving an extra 12 bhp for a total of 70 bhp, with a top speed of over 130 mph. Each Production Racer was hand built at the Norton race shop by former AJS rider and senior development engineer Peter Inchley. 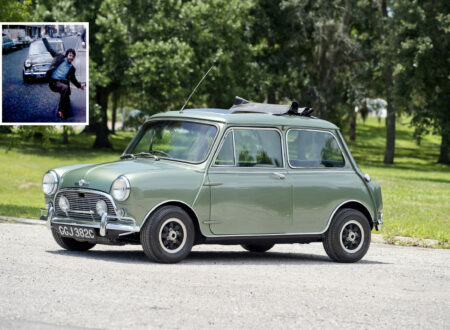 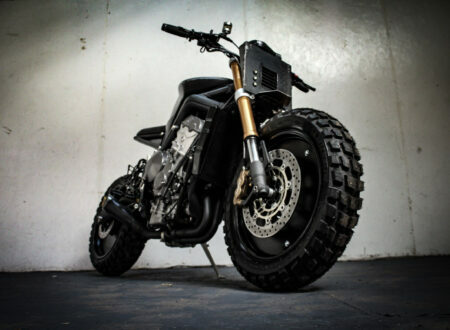 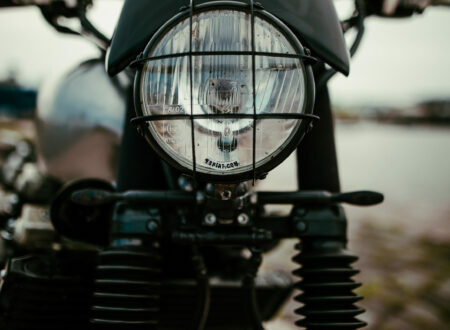 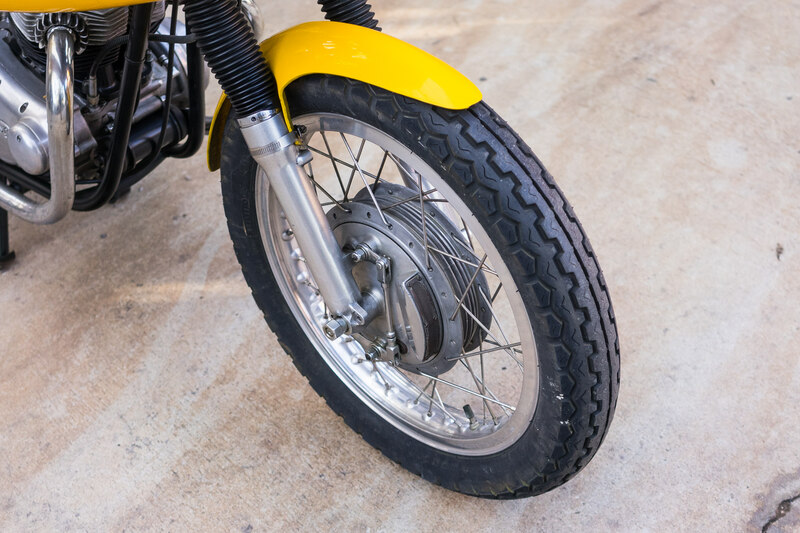 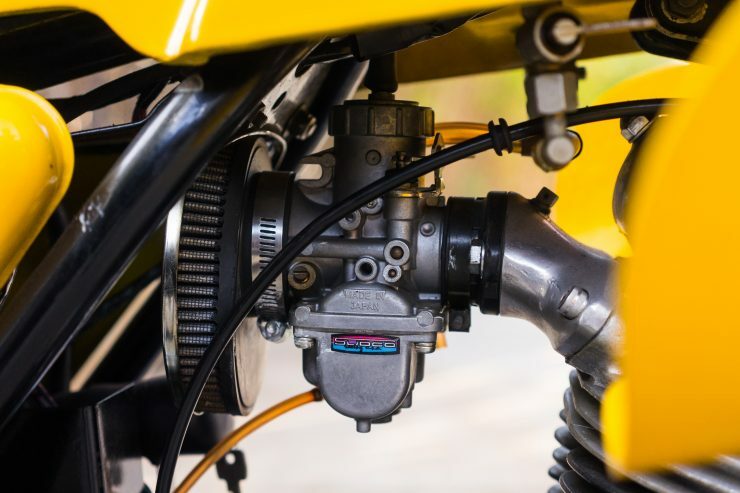 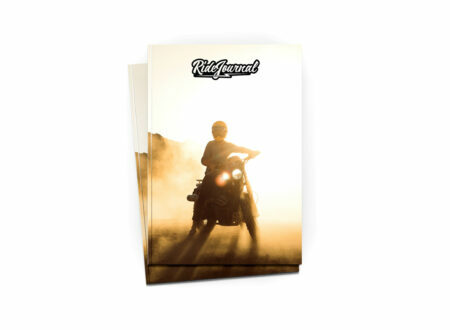 Each of the air-cooled parallel twins was built using standard crankcases and a standard crank, with weight-matched connecting rods, a 3S racing camshaft, high-compression pistons, and shortened push rods. 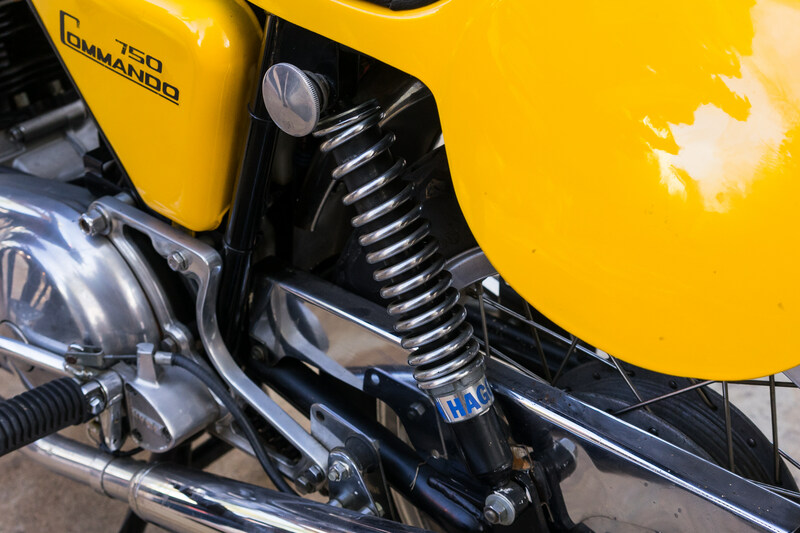 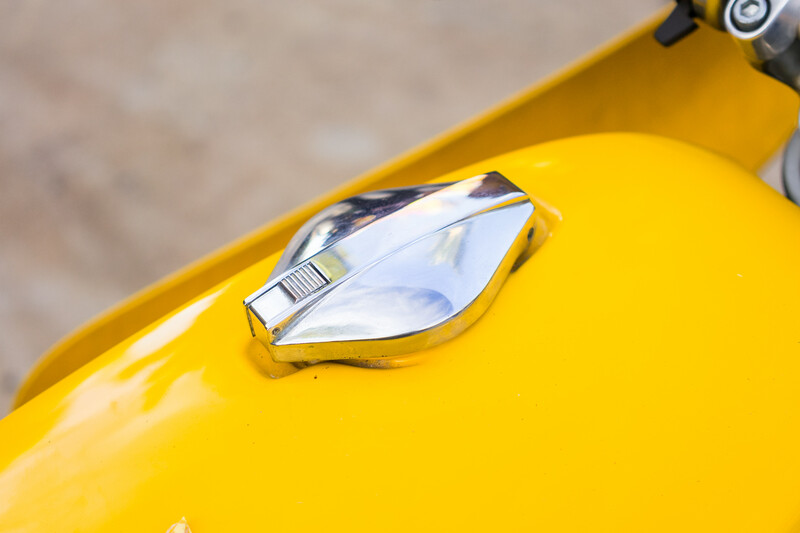 The heads were individually selected from the regular production line, then ported and polished, fitted with larger valves in phosphor-bronze valve guides, and polished rockers. 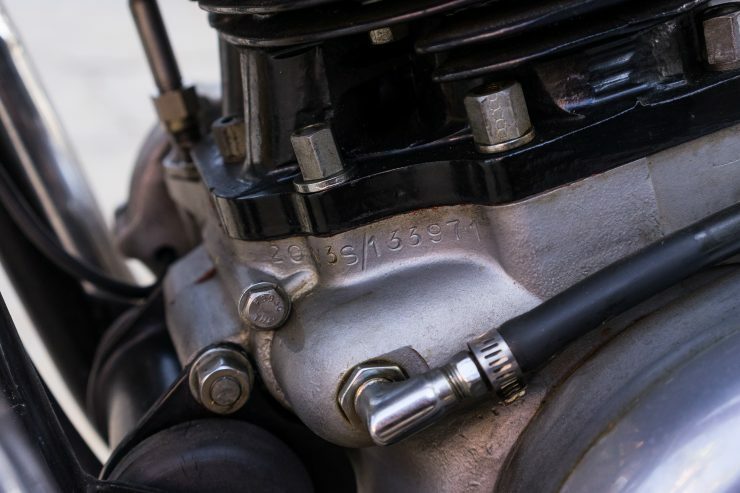 When ordering your Production Racer you could specify either 32mm Amal GP or Concentric carburetors, the newfangled Boyer-Bransden electronic ignition (rather than the traditional points), and either a close-ratio 4-speed gearbox or the longer-legged Quaife 5-speed. 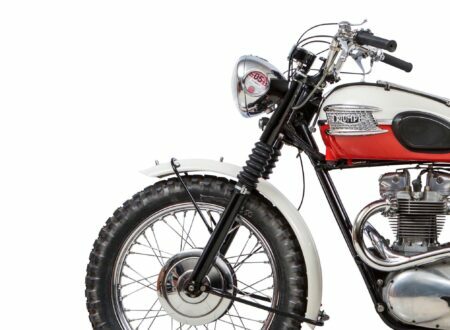 Suspension was modified specifically for the track, different wheels and tires were used, and a very attractive fairing, fuel tank, and seat were fitted – these are so beloved by the Norton faithful that’ve remained in production ever since by various companies in Britain and further afield. 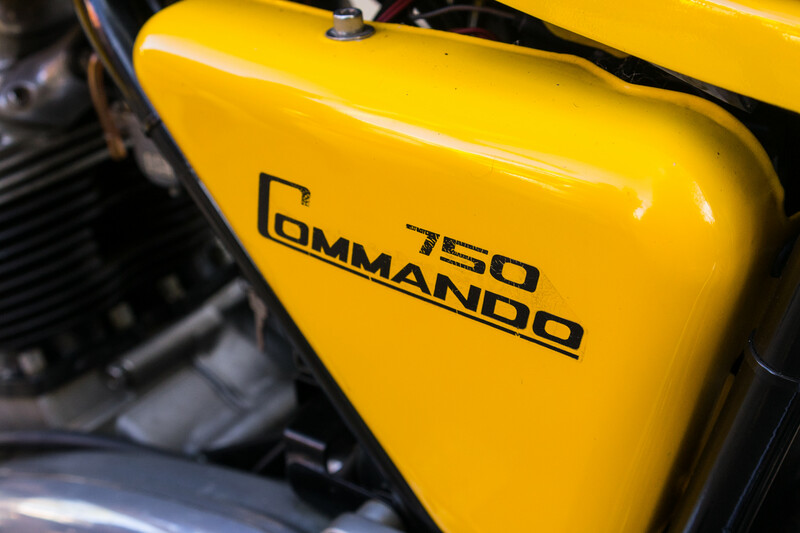 It’s believed that fewer than 200 original Norton Commando Production Racers were built, making them one of the most highly sought after Commando model variants, if not the most desirable outright. 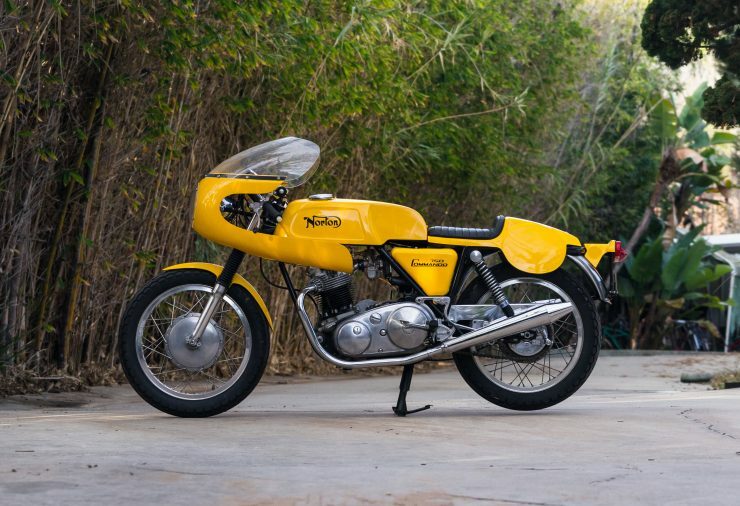 The Yellow Peril you see here is listed as a correct example by Mecum, the only two parts I can see that don’t seem factory original are the (single) Mikuni carburetor and Hagon rear shock absorbers, although it’s obviously common for these bikes to have had parts swapped out over the years. 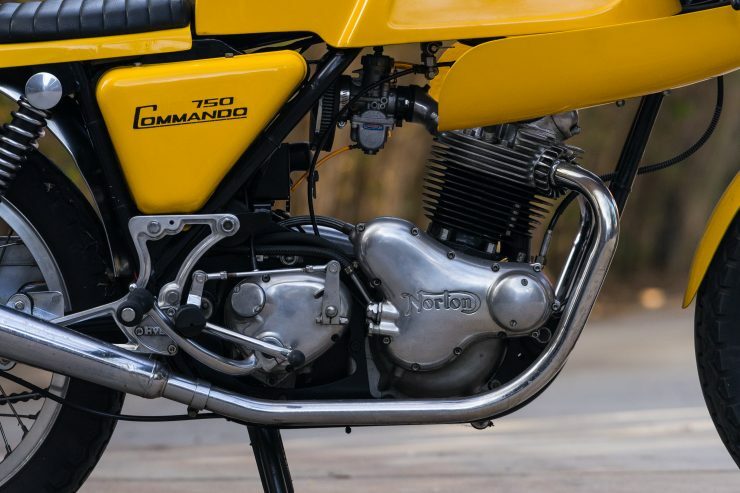 It’s fitted with front and rear drum brakes as Norton didn’t introduce the front disc until later in the model’s run. 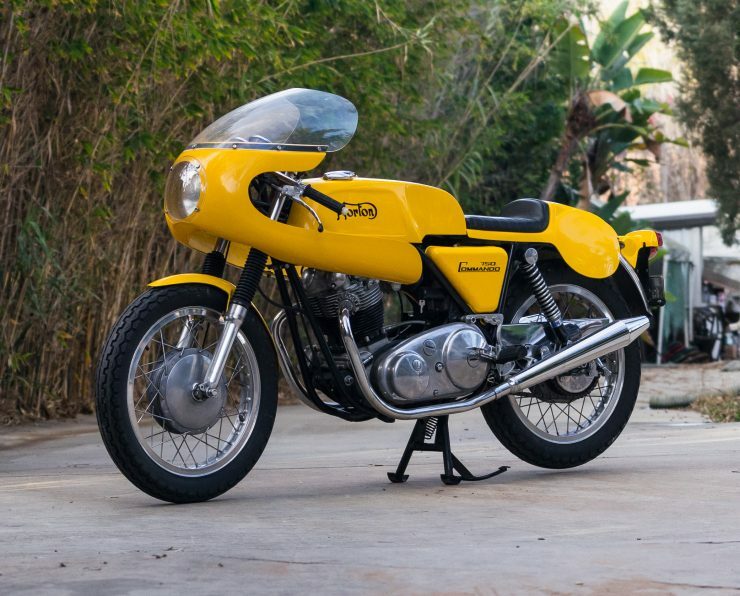 It’s due to be offered by Mecum as part of the Jim Lattin Collection in Las Vegas on the 1-2 of June, there’s currently no estimated hammer price, so it’ll be interesting to see what it goes for on the day. If you’d like to read more about this Norton you can click here to visit the listing on Mecum.